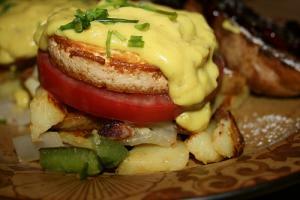 Vegan eggs Benedict recipes are hard to come by, not in the least because a vegan's diet prohibits eating eggs. Thus, it might seem silly for vegans to eat the dish at all, but the truth is that some simple substitutions can make a dairy- and egg-free version of the breakfast classic just as delectable. Aside from calling for eggs, the traditional eggs Benedict recipe features a rich Hollandaise sauce of egg yolks and butter as well as some type of meat, usually bacon or ham. As a result, it's necessary to alter the original quite a bit to end up with a dish that's suitable for vegans. 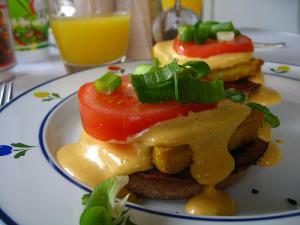 Still, the recipe below is far from the only version of vegan eggs Benedict. To find variations and other suggestions, do a quick Web search or seek out vegan cookbooks that focus on breakfast options and substitute ingredients. Finding substitutes for eggs, Hollandaise sauce, and bacon is one of the main struggles of making a vegan eggs Benedict recipe. A little creativity goes a long way, and calling on vegan standbys doesn't hurt, either. For eggs, most people substitute tofu. Any texture can work, from silken to firm. Some vegans like the crispness of firmly sauteed tofu, but others like to shred silken tofu and scramble it to more closely resemble scrambled eggs. It's best to prepare the tofu in the way you like it most and season it as you would season an egg. 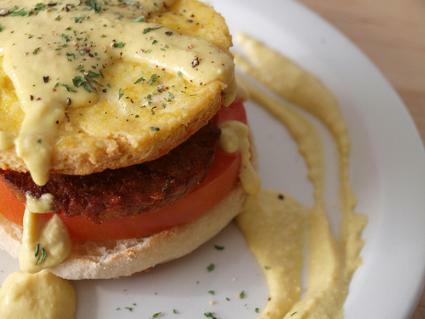 You won't be able to get the same "poached" texture, but soft tofu coupled with vegan cheese and vegan Hollandaise can help simulate the real thing. Recipes for vegan Hollandaise sauce vary, but most rely on a vegan spread to get a buttery taste and texture. Earth Balance is one popular brand that's widely available at health-food markets and even large grocery stores, but any type of non-dairy "butter" or margarine can work. Vegan sour cream, nutritional yeast, arrowroot powder, cornstarch or other thickeners can help step into the egg yolks' role of thickening the sauce and making it richer. To substitute for bacon, try a faux meat or faux sausage. You can also choose to crumble and salt tempeh and fry it until it's chewy. The recipe below will make six servings of vegan eggs Benedict. Drain the tofu, and cut it into six equally thick slices. Press the circular part of the top of a glass into each slice to get six circular pieces of tofu. Use a small bowl to combine the flour, nutritional yeast, turmeric, and other seasonings. One by one, place the tofu circles into the flour mixture and turn them to coat. Heat the olive oil in a frying pan over medium-high heat. Cook the faux bacon in the pan, and place it on paper towels to drain. Without washing the pan, place the tofu circles in it, and fry them on each side until golden. Drain the tofu on paper towels. Warm a saucepan over medium heat on the stovetop. Melt the vegan "butter" in the pan, and whisk in the other ingredients. Turn the heat down to low, and continue whisking until the mixture has thickened. Toast each English muffin, and break each slice of faux bacon in two. Top each muffin half with two bacon halves, and place a golden tofu circle on top. Drizzle Hollandaise sauce on each serving, and garnish as desired. As variations, consider adding tomato slices, green onions, chives, extra cayenne pepper, or vegan cheese. Although this recipe certainly meets the vegan standard, it might not meat everyone's taste expectations. Give the recipe a try, taste it, and decide if you want to add it to your collection of vegan recipes.